We’ve all travelled abroad with the best of intentions when it comes to speaking the language, only to falter when it comes to the crunch. This quick and constructive course gives you the Greek you need to talk to the locals – and crucially, the confidence to put it into practice. 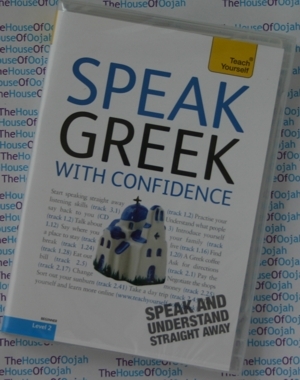 As well as providing essential vocabulary and phrases, the course also aims to improve your understanding of spoken Greek, so that you can feel sure of yourself in two-way conversations. * Boosts your confidence by providing strategies for understanding what you hear, so you can start a conversation without being afraid of the response! Finding/booking accommodation, hotel items/times of breakfast, types of room, with bath/shower etc, more numbers, times, dates, prices, money (euros), passport, culture: accommodation in Greece. Hara Garoufalia-Middle teaches Greek to adults of all ages and levels at the evening programme of the University of Westminster, and at the City Literary Institute. Howard Middle is ELT consultant to Thomson ELT and National Consultant for Greece for Trinity College London. Greek has a documented history of 3,400 years, the longest of any single natural language in the Indo-European language family. It is also one of the earliest attested Indo-European languages, with fragmentary records in Mycenaean dating back to the 15th or 14th century BC, making it the world's oldest recorded living language. Today, it is spoken by approximately 17�25 million people in Greece (official), Cyprus (official), Albania, Bulgaria, the Former Yugoslav Republic of Macedonia (FYROM), Italy, Turkey, Armenia, Georgia, Ukraine, Moldova, Romania, Russia, Egypt, Jordan and emigrant communities around the world, including Australia, United States, Canada, Germany and elsewhere. Greek is a language distinguished by an extraordinarily rich vocabulary. In respect to the roots of words, ancient Greek vocabulary was essentially of Indo-European origin, but with a significant number of borrowings from the idioms of the populations that inhabited Greece before the arrival of Proto-Greeks. Words of non-Indo-European origin can be traced into Greek from as early as Mycenaean times; they include a large number of Greek toponyms. The vast majority of Modern Greek vocabulary is directly inherited from ancient Greek, although in certain cases words have changed meanings. Words of foreign origin have entered the language mainly from Latin, Italian and Ottoman Turkish. During older periods of the Greek language, loan words into Greek acquired Greek inflections, leaving thus only a foreign root word. Modern borrowings (from the 20th century on), especially from French and English, are typically not inflected.